At the core of family-friendly cruise ships is usually a water slide. In the race to entice more families to try cruise holidays, cruise lines are installing a range of water slides on their vessels. When once a water slide was a rarity, now ships often feature a selection. Smaller, gentle rides for younger kids and scaredy-cats; adrenaline-inducing thrill rides only for the brave. I've picked my top 10 best cruise ship water slides available on cruise ships around the world right now - complete with point-of-view (POV) videos of each from holidaymakers around the world. 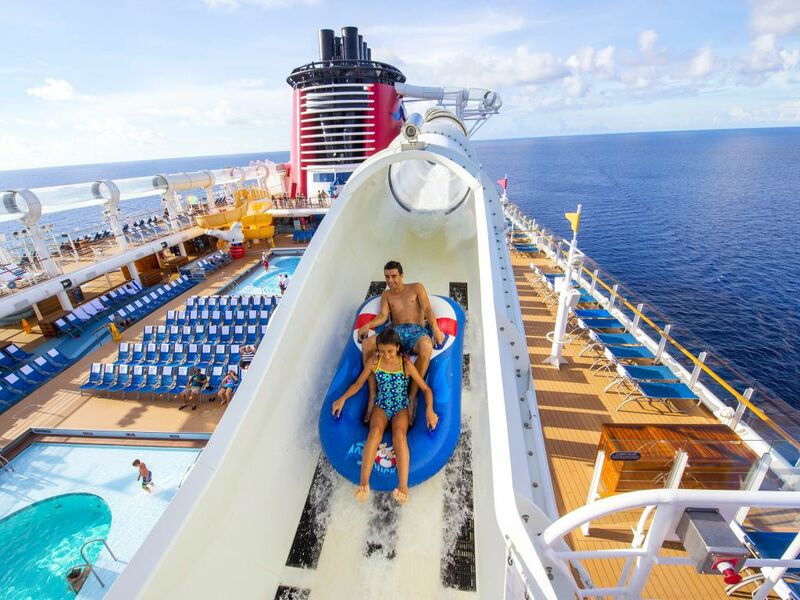 Both the Disney Dream and the Disney Fantasy boast the AquaDuck, a raft-based water slide at sea. It offers everything you could want, fused with Disney flair. The slide measures 233 metres in length and is full of turns, ups and downs. Primarily comprised of transparent sections of tubing, the ride offers superb views over the ocean - especially as it darts out over the open ocean below on the first turn. There are a couple of open-air sections too. The ride follows the outline of the pool deck below, passing through the forward funnel and returning back on the opposite side. This smart design means the fun lasts longer than most other water slides. Perfect for adults and children with a height greater than 107 cm (42 inches). Single riders must be at least 137cm (54 inches) tall or greater. In addition to the height restriction children under 7 years of age must ride with someone aged 14+ years. Swim goggles are not allowed on the slide nor are swim nappies / diapers so children need to be toilet trained to ride due to health and safety regulations. Ride on your own or as a couple on inflatable rafts. Vertigo is the name of the slide on MSC Preziosa which claims the accolade of the longest single-rider water slide at sea at 120 metres in length. The dark blue enclosed slide does not feature much in the way of twists and turns throwing you from side-to-side but what it lacks in twists it more than makes up for in thrill factor. Hurtle through a nine-metre transparent section of slide that extends out over the side of the cruise ship. Its name derives from the feeling you will have as you look down 18 decks to the ocean below. Perfect for adults and children taller than 120cm (47 inches). Ride on your own only. No rafts are used on this water slide. Known as the fastest drop slide at sea, this slide on Norwegian Getaway will have your heart pumping. Enter the capsule, wait for what feels like forever and then all of a sudden the floor drops beneath you sending you hurtling along this water slide. Experience up to 4Gs of force as you plummet down this water slide. The slide banks around before coming to a splashy end. The floor drops away on this slide so you need to listen to the instructions carefully and stand in the correct pose to avoid injury. Speedway Splash in WaterWorks on Carnival Sunshine is a dual-lane, 72-metre long slide with a race theme. Elapsed times are displayed at the end of the ride making it ideal to settle family disputes! The ride is full of twists and turns which together with speed makes for an excellent ride. The Epic Plunge Slide on Norwegian Epic is one of the most colourful available and starts with a short enclosed tube ride before circling a large bowl, circling ever closer to the centre. Once you get to the middle, you will fall into a short enclosed tube before reaching the end of the ride. The 61-metre slide is not a fast-paced thrill ride but will appeal to all water slide fans. Swim nappies / diapers so children need to be toilet trained to ride due to health and safety regulations. Ride on your own on inflatable rafts. The Green Thunder waterslide on Carnival Spirit and Carnival Legend does not get the attention it deserves. It is a vertical drop slide. Step into a capsule and wait for a countdown before the floor drops away - sending you hurtling along the slide at blistering speeds. One ride reserved for thrill seekers, the slide measures 57 metres in length and starts with a 10-metre drop where you can reach speeds of 25 miles per hour! The water slide on MSC Divina is the second MSC Cruises slide to feature in this countdown of the best cruise ship waterslides at sea. While this slide lacks both a cool name (it is just called the "Water Slide") and the vertigo-inducing aspect of the water slide found on MSC Preziosa, it makes up for it with an abundance of twists and turns. The slide boasts a standard figure of eight design and occupies a relatively small space, making the turns tight. They come thick and fast, one after the other. The Twister Waterslide is a staple of Carnival cruise ships and is a tube slide full of twists and turns. There is not a straight section in sight as you turn from side to side hurtling down the slide. This unpredictable ride offers thrills for all ages and according to Carnival it can by found on all of their vessels. On Carnival Breeze this slide spans 92 metres, but on Carnival Sunshine it is even longer at 102 metres. The Whip is the name given to the corkscrew-style water slide on Norwegian Breakaway and Norwegian Getaway. A dual-lane slide in magenta pink and yellow, the ride spirals down to the bottom, making it ideal for competitive races with friends and family. There are no unpredictable turns so the speeds attained can be quite fast. The yellow slide is a great all-rounder but for a more rapid experience choose the pink slide - it has tighter turns which equate to increased speed. The Carnival Drainpipe starts with some twists and turns inside an enclosed tube before banking to one side. Then you are launched into a large open air bowl where you make your way to a set of stairs to exit. While the tube section looks thrilling the bowl area seems somewhat anticlimactic especially as you make your way to the stairs. What is your favourite water slide on a cruise ship? Do you prefer the thrill rides or the more gentle options? Leave a comment below.